The internet offers choice in variety of topics in addition to choice in numbers of news sites. 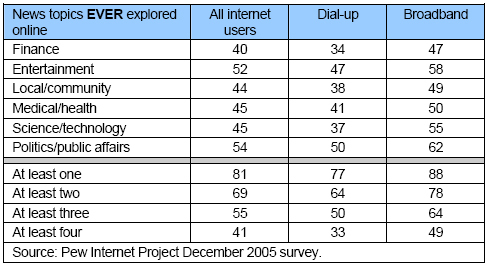 Our December 2005 survey not only asked internet users a general question of whether they get news online, but also asked them about six different kinds of news available online. The table below shows that internet users have a wide range of online news interests. A strong majority (81%) have gotten news about at least one variety of news asked about and more than half have sought out three types of news topics online. Broadband users, unsurprisingly, seek out a greater variety of news topics online and indeed half have explored four of the six topics at an online news site. 73% have gotten news about entertainment (a 25 point margin over remaining broadband users). The interactive nature of the internet allows users to have a “hands on” relationship their online news experiences in a way that wasn’t possible ten years ago. Online news consumers can get specialized news alerts or probe online archives; in some cases, they may be asked to pay for these items. A frequent occurrence at an online news site is for a user to be asked to register at the site, which usually involves providing some demographic information and often requires the user to set up a password to use the site. Overall, 45% of internet users say they have done this, and of those who say they have ever gone online for news, 53% say they have registered at a website in order to get news and information. These number rises to 54% for all broadband users and 59% for broadband users who have gotten news online. In addition to being, often, a gateway to news, registration at news sites facilitates paying for content that news sites may offer for a fee. Such items may be past news articles, news broadcasts, or video clips. Not many internet users pay for such content; only 6% say they do. Home broadband users are more apt to do this than dial-up users by a 8% to 4% margin. High-powered broadband users are most likely to do pay for news content; 14% have. Just about half (48%) of all those who have paid for this kinds of online news content are in the broadband elite. As to setting up personal preferences for news alerts, 19% of all internet users have done this, or about 23% of online users have visited a news site online. Fully 61% of those who have done this are broadband users. The following table shows the kinds of preferences users set—both for all respondents who have done this and home high-speed users. The plurality of internet users simply wants the headlines or to be notified of breaking news when they set up preferences at news sites. 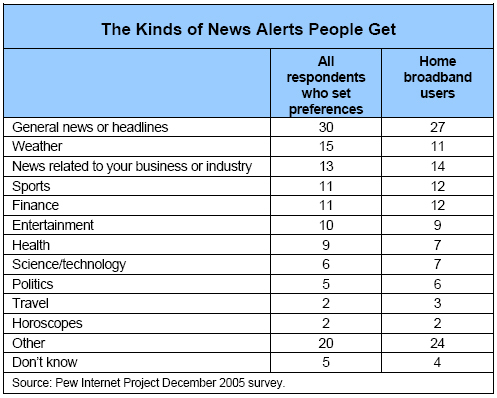 There is nonetheless a variety of interests for news alerts, as one-fifth of all online users identifying some “other” category of news alerts not listed. 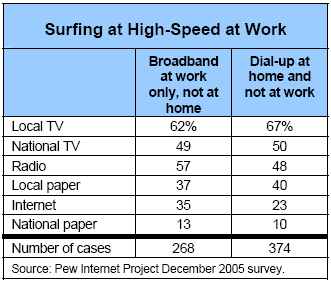 Many dial-up home users use their high-speed access at work to gather news online. With about 40% of Americans who go online from home still using dial-up connections and with 77% of employed Americans with workplace online access having high-speed at work, some home dial-up users enjoy broadband at work.8 As it happens, some 44% of dial-up internet users have high-speed connections at work. It is no secret that online connections in the workplace are used not solely for business purposes. Online retailers are well aware of “Black Monday,” the Monday following Thanksgiving, when people begin their online Christmas shopping, with much of that happening during work hours and, presumably, from the workplace. The table below shows that checking out what’s going on in the world is among the non-work-related online activities that take place at the office.